The Craft Professional of the Year, announced each year during ABC Workforce Week, is one of the most prestigious awards in the construction industry and a major accomplishment for the deserving craft professional who takes home the prize. How is the Craft Professional of the Year Selected? Companies are encouraged to nominate trade employees who emphasize safety on the job site, best exemplify company values, exhibit exceptional work ethic and demonstrate superior skill excellence in their trade. Eligible nominees must be employed by an ABC member firm and have approximately 90 percent of daily job duties revolve around tools and equipment*. Nominated craftsmen have expressed passion for their trade, mastered their skillset and taken a hands-on approach to ensuring jobs are completed at the highest standards of quality within the construction industry. After nominations close, judges select four finalists to be flown down to the annual ABC Workforce Week event where a Grand Prize Winner is announced at a live event. What is ABC Workforce Week? Workforce Week is ABC’s annual celebration of the best in merit shop construction, recognizing the contributions of members, chapters and craft professionals to the construction industry and their dedication to excellence. This year, ABC Workforce Week takes place February 28 through March 3 in Fort Lauderdale, Fla., and culminates with the Craft Professional of the Year announcement on Friday at a Careers in Construction Awards Ceremony. Tradesmen International is honored to again be the primary sponsor and participant in the ceremony celebrating the four CPOY finalists and their outstanding skills and leadership qualities. 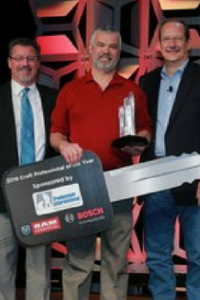 In what is always an emotional ceremony, the Grand Prize Winner is announced and awarded the Craft Professional of the Year award before hundreds of peers. Then, the hard-working recipient becomes the proud owner of a brand new 2017 Ram Tradesman® Truck as well as a Bosch REAXX Table Saw, trophy and feature in Construction Executive. As we approach ABC Workforce Week 2017, it’s important to remember the most important element of the construction industry is the hard working personnel who do more than just get the job done. Tradesmen International recognizes all of those that have contributed to building America from the foundation up while accentuating safety and instilling the highest standards in their craft.